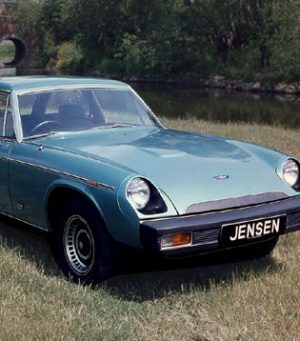 The Jensen GT was the last ditch attempt by Qvale to keep Jensen Motors in operation. 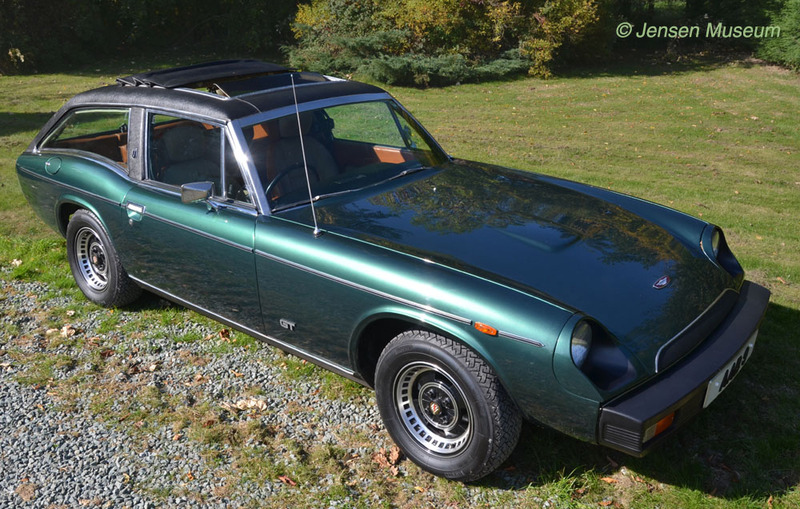 The idea of a shooting brake Jensen Healey, with close to Interceptor levels of refinement had merit, but it wasn’t going to save the Company. Incredibly, just over 500 Jensen GT cars left the factory between September 1975, and the factory’s closure in May 1976. 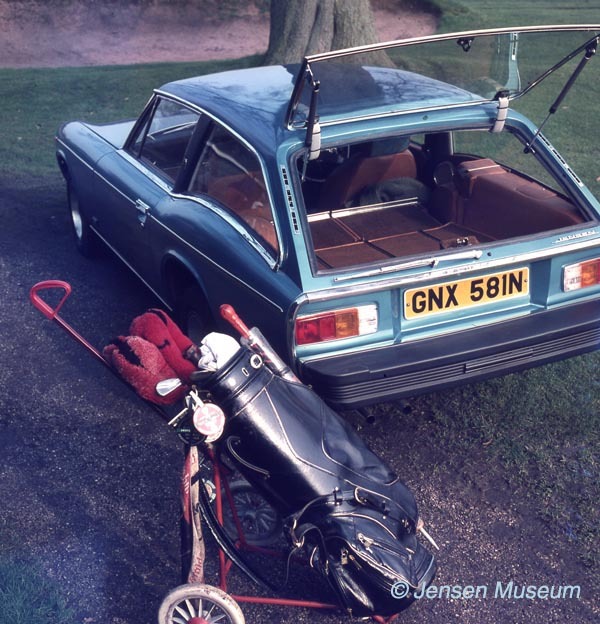 Jensen GT RHD prototype (chassis number 19850), photographed by Michael Cooper from Good Relations in 1975. The car was painted in Jensen reef blue. 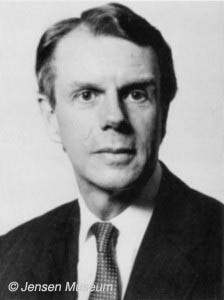 The trim and paint specification was orchestrated by Kjell Qvale. Sketches for a shooting brake Jensen Healey had taken place back in 1972, and the idea was followed through in 1973. Agreement for the GT to go into production (without the Healey name attached) was given by Qvale in January 1974. The fact was, with the petrol crisis, and falling Interceptor sales, a new, more economical car was needed. Qvale had yet to pull the plugs on the ‘F’ Type & ‘G’ Type projects, but meanwhile was giving his attention to this up-market shooting brake version of the Jensen Healey. “According to Richard, the majority of the board had decided they didn’t want the Healey name attached to the car. The new car was going up-market from where the Jensen-Healey was positioned, and as such, they felt the Healey name wasn’t relevant. Apparently, Healey put up a fight, stating this was a derivative of the Jensen-Healey, and as such should bear his name, but this was countered with the facts the body had been radically changed in appearance, as had the interior. “When Qvale initially discussed the Jensen GT with me, I had reservations about how Jensen Motors was going to position the car. I was certainly against the car being positioned, either as a ‘baby’ Interceptor, or indeed, as an Interceptor replacement (although it had been made clear to me, the GT was not going to be an Interceptor replacement). And that was the problem, where was the Jensen GT going to fit into Jensen’s marketing. It is also worth mentioning that neither the ‘F’ Type, or indeed the ‘G’ Type were completely shelved at this stage. So theoretically there could have been a range of cars to position correctly for marketing. The GT was undoubtedly different to the Jensen-Healey, which had the Healey name attached to it – a name of some importance, and beneficial to the Jensen brand. On the other hand, the GT would not have the Healey name behind it, and even worse, Qvale was thinking of fitting Interceptor badges to the car. I was against that type of connection with the Interceptor. Good’s reflections on the positioning of various ongoing projects; the GT in particular; is interesting. Under Qvale’s direction, Jensen Motors was changing tactics. They had one medium priced sports car, the Jensen-Healey, and the expensive Interceptor range. “Jensen have been able to choose their distributors and dealers with more than the usual amount of care, for unlike the car giants looking for market saturation it has not been essential to be represented in every centre of population. Donald Healey with Kjell Qvale. 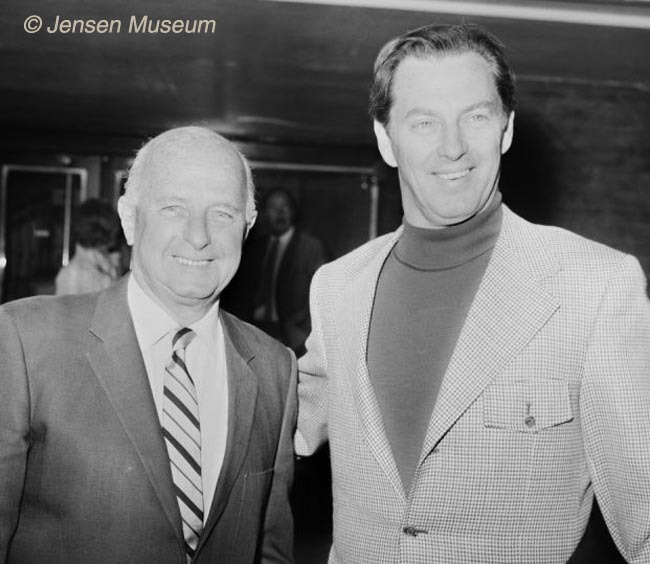 Unfortunately the smiles had worn thin by 1973, and Healey resigned as Chairman of Jensen Motors. Healey’s name never appeared on the shooting brake version of the Jensen-Healey. 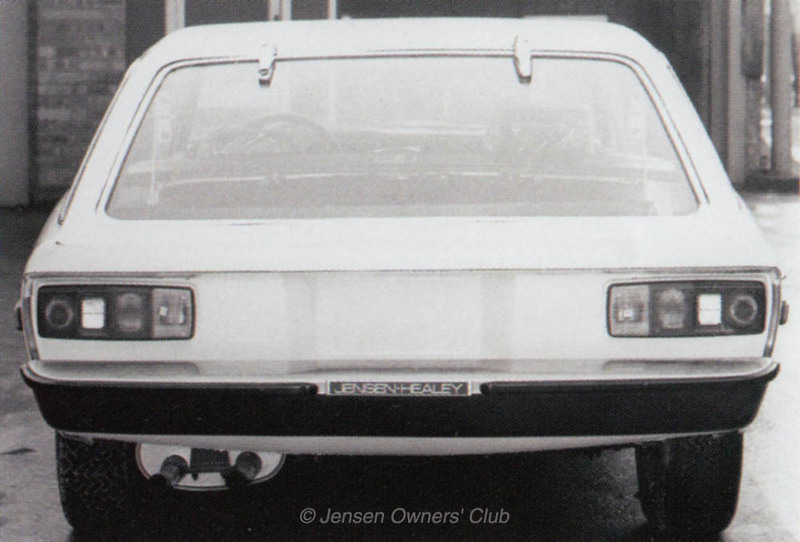 But the Jensen-Healey cam covers that had adorned the Jensen Healey, continued to be used up on the Jensen GT. 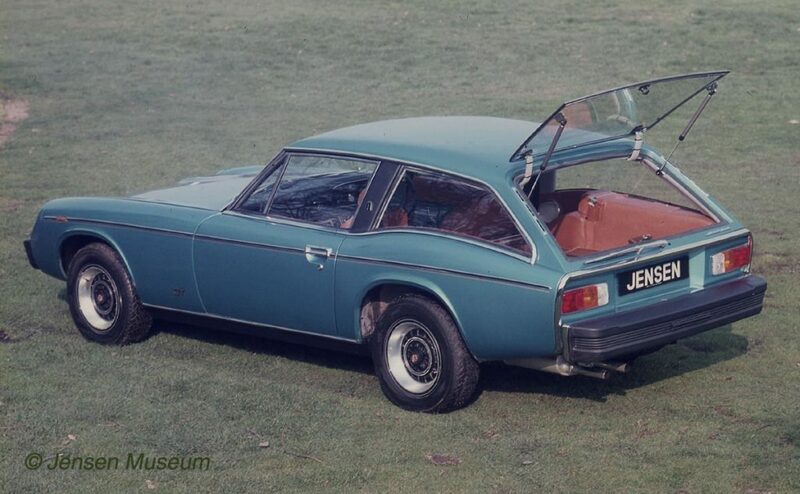 For a relatively small looking vehicle, the Jensen GT had an impressive amount of space in the back, increased largely with the back seats dropped flat. Photograph taken by Michael Cooper (Good Relations) in 1975. 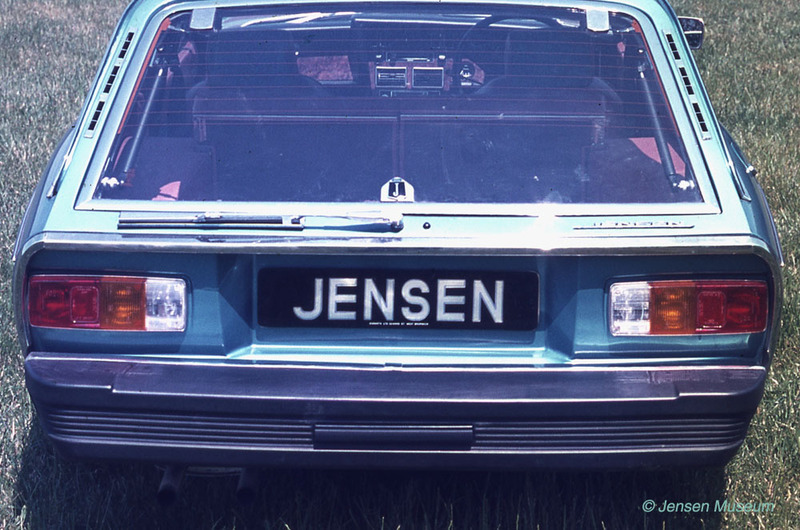 The familiar Jensen GT badge as fitted to the rear bumper, was a later idea, that went onto production cars. The idea was to use the Healey platform, but to build the car up as a sporty fixed head estate car. 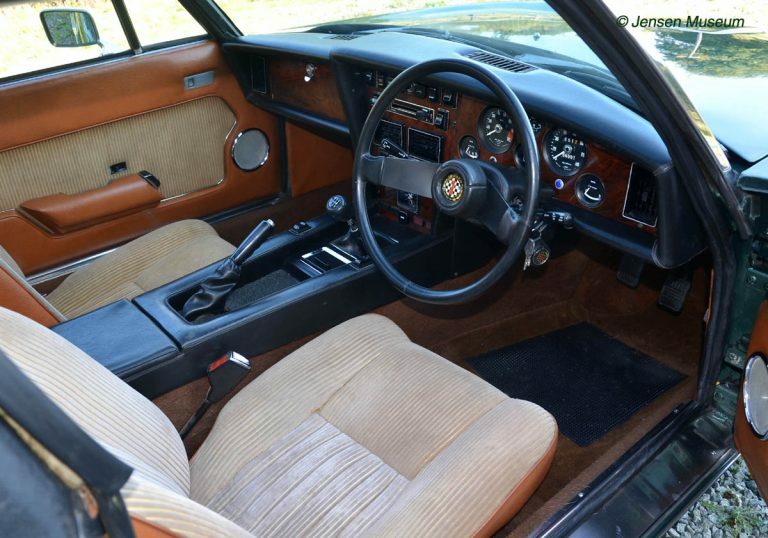 The new car, designated as the Jensen GT, would host many refinements not available in the humble Jensen Healey – such as a full burr walnut fascia and electric windows. There was even leather and air-conditioning options. 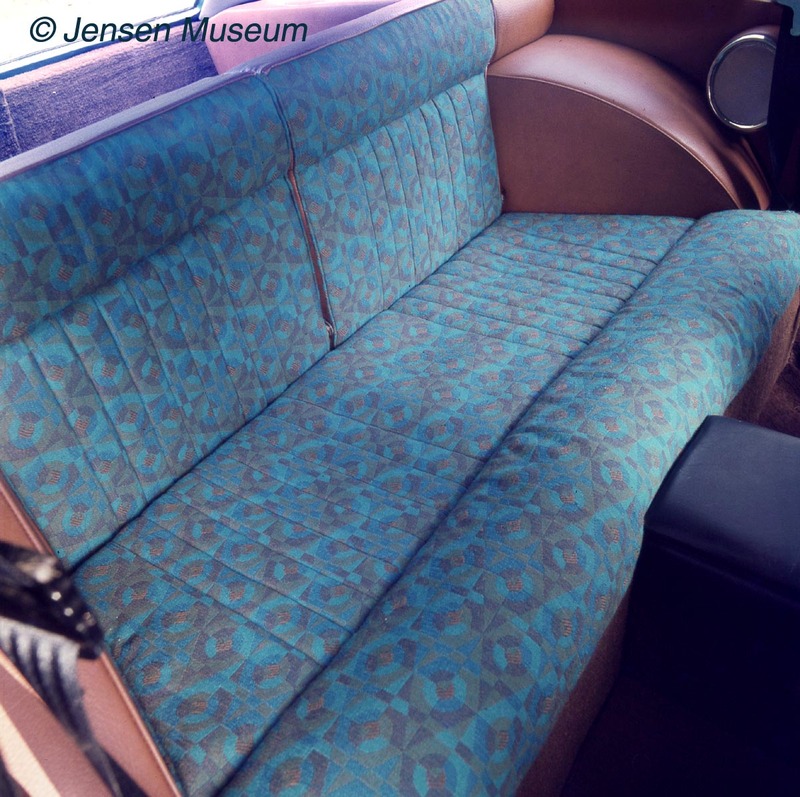 To add the hand-made feeling to buyers, a small stainless steel plaque was mounted to the inside of the dashboard pull down locker lid, stating, “Coachwork by Jensen Motors”. The fine burr walnut dashboard, a miniature version of the walnut dash that Qvale came up with for the new Convertible Interceptor launched in 1974. It was this dashboard that gave the Jensen GT an instant air of sophistication. It was hoped that this smaller-engined vehicle, with close to Interceptor levels of interior refinements, and realistic petrol consumption, might together be a miracle combination that could save Jensen Motors. The Development Department at Jensen Motors were given the job of building the new prototype Jensen GT cars. The Lotus 2-Litre engine with 5-Speed manual gearbox. It was this unit that was fitted into the Jensen GT. Although Healey’s name had been wiped off the exterior of the GT, the Company continued to use up the left-over ‘Jensen-Healey’ cam covers. “ a Healey shell came off the line, and was brought into Development. Our metal guys scratch built the GT roof, based on the working drawings. Afterwards, the vehicle went over to the paint shop and was sprayed a dark blue colour. With the overall look of the initial GT accepted and signed off, two further Healey shells were taken off track. These were given over to the Development Department to be built as GTs. The two cars were built up during 1974, one as a left-hand-drive GT (Healey chassis 13910), and the other as a right-hand-drive GT (Healey chassis 19850). Much of the bright-work on the two prototypes was chromed brass, but for the production cars, most of the bright-work would be changed to stainless steel. 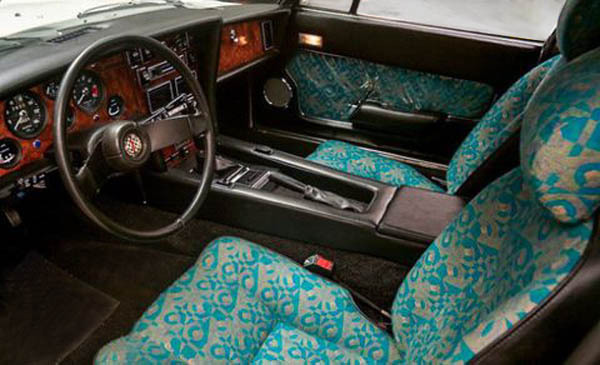 Initially both cars were finished with the standard Jensen Healey dashboard, and in fact, some of the original publicity photographs taken of chassis 19850 by Michael Cooper show the Healey dashboard still in place. 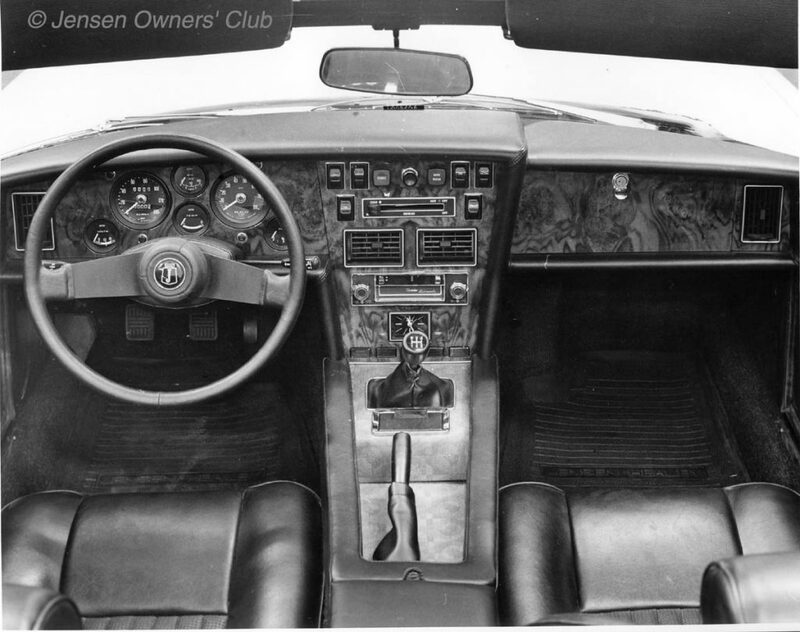 When chassis 19850 had the full burr walnut dashboard fitted, yet another photo shoot had to be arranged. The LHD prototype 13910. 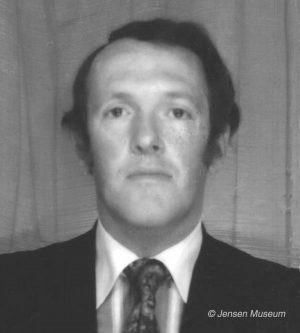 The photograph is believed to have been taken in autumn 1974. At this stage Vincent hadn’t come up with his frontal ‘moustache’, and it may never have been fitted to the LHD prototype. Various changes were made to the RHD prototype, as small design improvements were discussed. One small change (visible in this photograph), is the ‘J’ badges mounted by the doors. On the LHD car, they were mounted at the base of the pillar. On the RHD car, and production cars, the ‘J’ badges were moved upwards by about 6cm. Rear view of the LHD prototype. All LHD production cars would have the squared off number plate area on the back panel. Car’s for the home market had a rectangular inset to accept the standard registration plates. 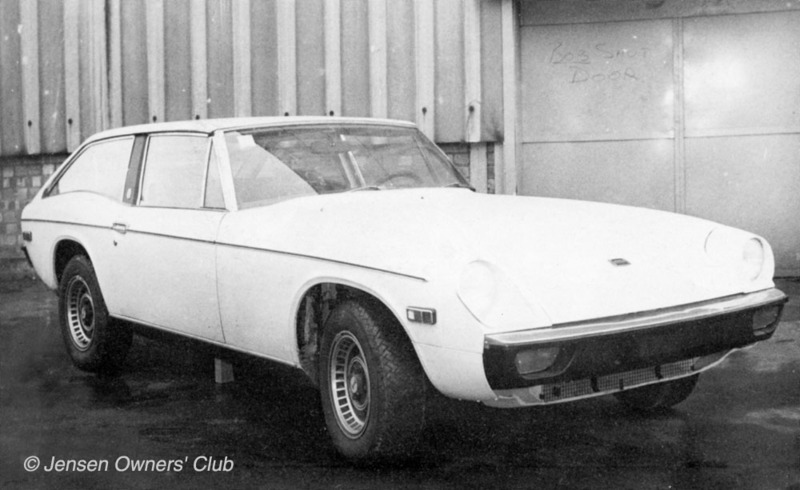 The bumpers were basic Jensen-Healey on this LHD prototype. These would be changed to so-called Federal bumpers, helping the car to take a 30 mph frontal impact. Jensen GT LHD prototype car chassis number 13910. The interior was finished entirely in black. Qvale had found a special electric blue cloth, and requested that the RHD prototype (chassis 19850) was trimmed in that material with tan. He liked the electric blue material so much, that he also requested the door insets and centre panel of the LHD prototype were re-trimmed in the same cloth. Note the Jensen-Healey front mats, and the ‘J’ shield badge logo to the steering wheel boss. Both of these would be changed on the production cars. Michael Cooper’s first Jensen GT photo-shoot. GT RHD prototype chassis number 19850, still had the Jensen-Healey type dashboard at this stage. The wheels were also changed shortly afterwards. 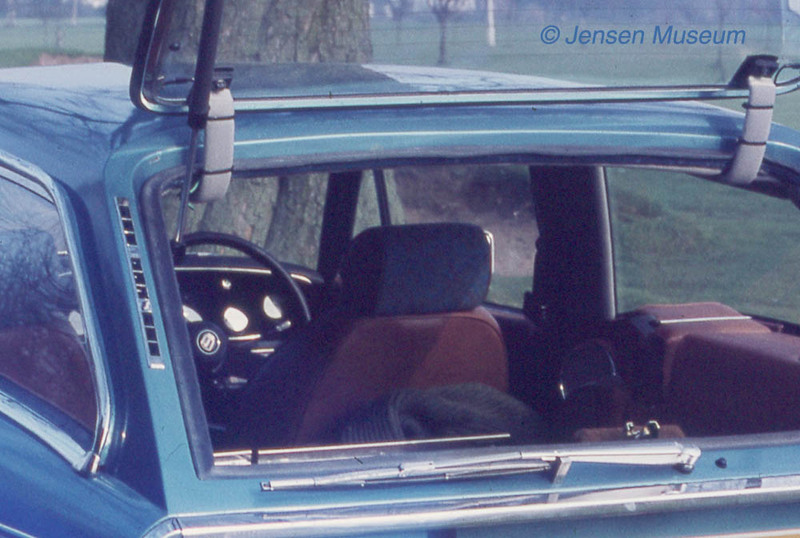 The Jensen-Healey dashboard can clearly be seen in this photograph from Michael Cooper’s first photo-shoot. Qvale had initially looked at using a gold and black Jensen shield motif for the centre of the horn push, but when the cars went into production, this was changed to a ‘J’ on a chequerboard background, the same as used on the wheel centres. Qvale didn’t like the top rear hatch hinges on the LHD prototype. These were changed to a more aesthetically pleasing type on the RHD prototype. The RHD prototype had the chrome rear tailgate hinges changed. These flatter and wider hinges gave a much more modern look to the rear of the car. However, on the production cars the external chromed hinges were dropped altogether, and they were hinged from the inside. The LHD GT was finished and registered in December 1974 with the number GNX 579N, and the RHD GT was finished and registered on the 14th February 1975 with the number GNX 581N . 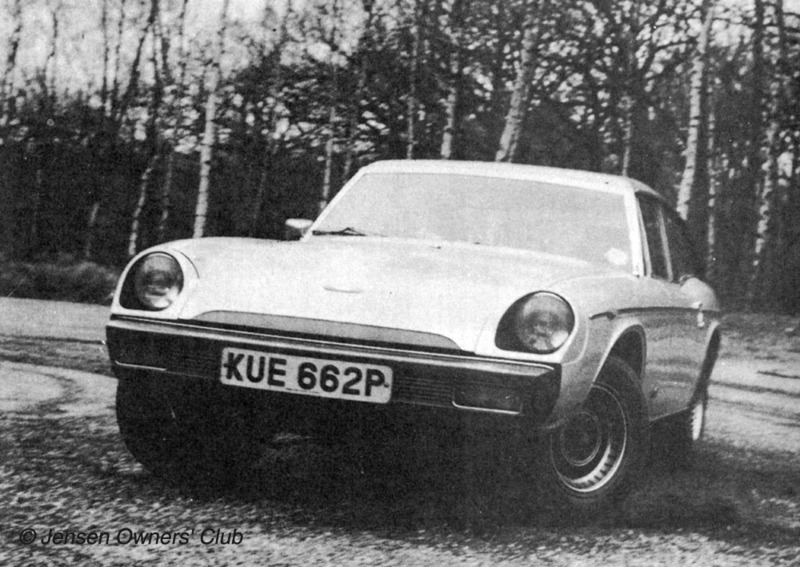 Surprisingly, the DVLA files show that Jensen Motors called the new car a Jensen Healey GT at that stage, although immediately the car was set for production, the Healey connection was removed. “ Apparently Lotus had been playing up in regard to the on-going supply of engines. In short, they were trying to up the unit price. 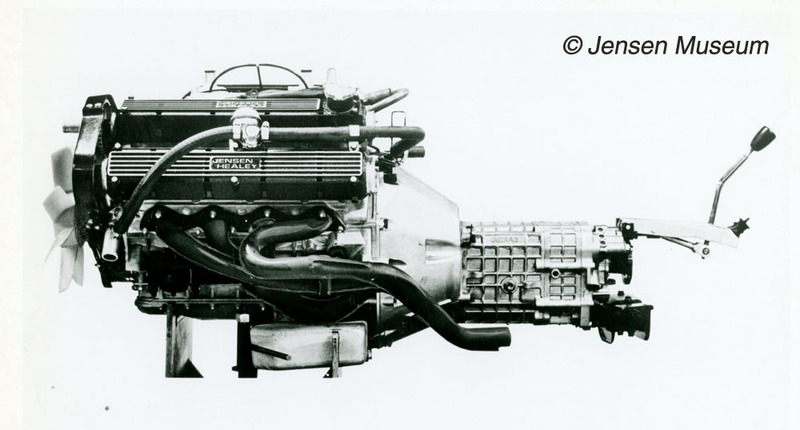 Development was asked to trial the Vauxhall engine in the two prototype GT cars, which we did. Actually it worked quite well, and allowed Jensen Motors to use this fact when negotiating with Lotus. “the two prototype GTs [13910 and 19850] were initially fitted with the usual Lotus engine. In fact one of the first jobs I did to GNX 581N [chassis 19850] was to trial air-conditioning. We found a really compact Japanese compressor, which we managed to fit very neatly to the Lotus engine, and this worked very efficiently. Not long after we were asked to trial the Vauxhall engine, so removed the Lotus engines, and fitted Vauxhalls. The air-conditioning compressor didn’t easily fit to the Vauxhall engine, so we took the A/C system off GNX 581N, and never refitted it when we re-installed the Lotus engine. The unusual electric blue material that Qvale had found. Qvale liked this electric blue and orange patterned material so much, that he had the trim department refinish the first LHD GT (chassis 13910). 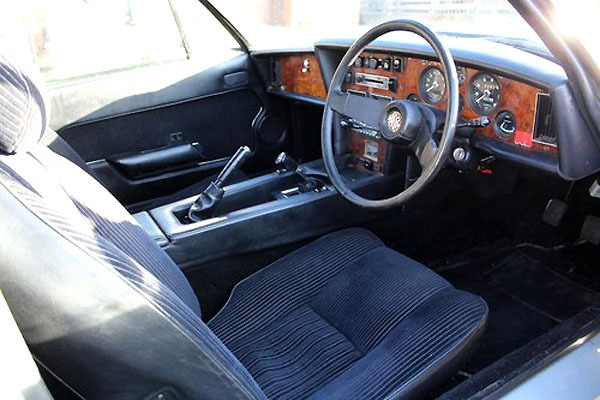 The car had initially been trimmed in black cord and black vinyl, but this was subsequently changed to have the electric blue material to the insets of the door panels, and to the centre gear stick area. It was Vincent that also came up with, what is now affectionately called by enthusiasts of the GT, as the ‘moustache’. A stainless steel strip towards the front of the bonnet with a section of black Everflex material. “As GT 19 850 neared completion, I noticed that we had this large black bumper line and light blue bonnet. I didn’t like the way the light blue and black cut a straight line along the front. I played around with various ideas, and eventually came up with a stainless steel strip, which sat about 2” up from the front bonnet edge. The two ends of the strip were bent downwards, and then the area of painted bonnet in between had a section of black Everflex glued in place. I wanted to break up that hard line, and thought this looked a bit like an air-intake. Qvale came and had a look. He liked the idea, and so, with his approval, that is how the ‘moustache’ entered into production. At the same time, Qvale initiated another small change. The GTs were to have a standard red enamelled Interceptor badge fitted to the bonnet, but on the reef blue painted RHD prototype [19 850], he wanted a blue enamelled Jensen badge fitted instead. It was the only GT to have a blue enamelled badge. All production GTs had red enamel badges. As soon as GT chassis 19 850 was finished and registered as GNX 581N, it was driven locally for a photo session. Michael Cooper was used once again, taking a large variety of images of the car. A selection were used for the initial publicity brochure for the Jensen GT. 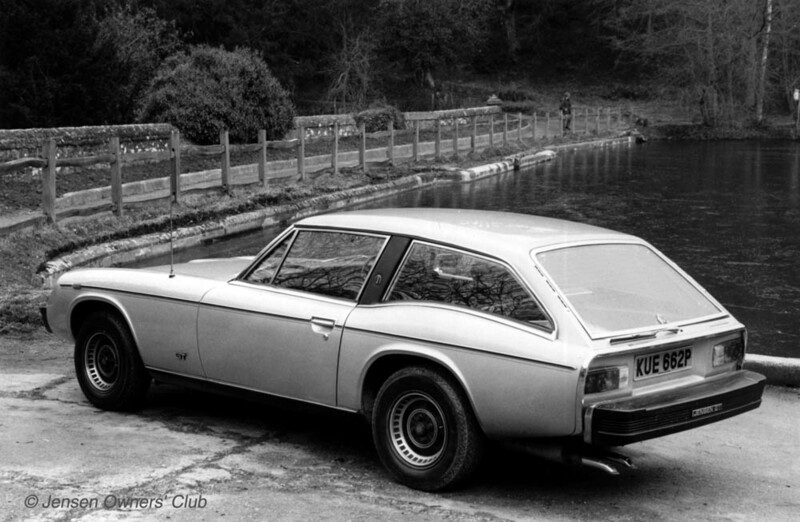 Against Good’s better judgement, Qvale had gone with enamel Interceptor badging for the bonnet, and even fitted a chromed Interceptor ‘Jensen’ badge to the rear [just below the tailgate]. Additionally, there were enamel Interceptor ‘J’ shield badges positioned either side to the rear panel pillars. However, there was also unique ‘GT’ badging. The wheel centres had a ‘J’ on a black & white F1 / Motorsport inspired chequerboard, and the same design was used as a centre horn push to the steering wheel. It was an inspired design by Qvale, which set the right flavour for this car. There was also ‘GT’ badges fitted either side of the front wings. As with Vincent’s ‘moustache’, Qvale later decided to remove the chromed Interceptor type ‘Jensen’ from the rear. The badge was deleted from production car 30051 onwards, as was the ‘moustache’. With prototypes assessed and agreed, work started to get them into production. Jensen GT chassis numbers started from 30 002, and it is believed the 2 represented the two prototypes that had already been built up. The chassis numbers then followed through to 30 510. In addition to the chassis number, there was also the proceeding ‘WXYZ’ number. As with the Jensen Healey, and later Interceptors, this was a four digit number which gave various information. An internal Jensen Motors document dated 5th August 1975 gives a breakdown of costs for the Jensen GT and Jensen Interceptor. The total variable cost for the GT was £2,454, and £4,150 for the Interceptor. The same document states that the total cost of tooling and jig work for the GT development was £120,000. There would be some further cost to get the GT through the new safety and pollution regulations in force within the USA. The 30 mph crash impact to the front took place in July 1975, and in September, the 4000 miles emissions test, along with Federal braking tests, took place, and were passed without difficulty. With all the relevant testing completed, and the paperwork in place, the GT was ready to be sold into the USA. Qvale had high hopes for the new GT in the Stateside car market. On release the Jensen GT sales price was around £4,500, so even with the dealers margin to be taken into consideration, a realistic profit margin had been set in place. It is easily forgotten today what the cost of a Jensen GT at a launch price of £4,563 (including taxes) was comparable with at the time. The average salary of someone working in London was just over £2000, and the average cost of a standard new family car was just under £2000. The Jensen GT was way outside the pocket of the average buyer. That said, the person with the odd £4,500 in their pocket to buy a car with, could have bought a Datsun 260Z 2 + 2 at £4,598, a Reliant Scimitar GTE at £4,368, or an Italian offering of the Alfa Romeo Alfetta GT at £4,198. 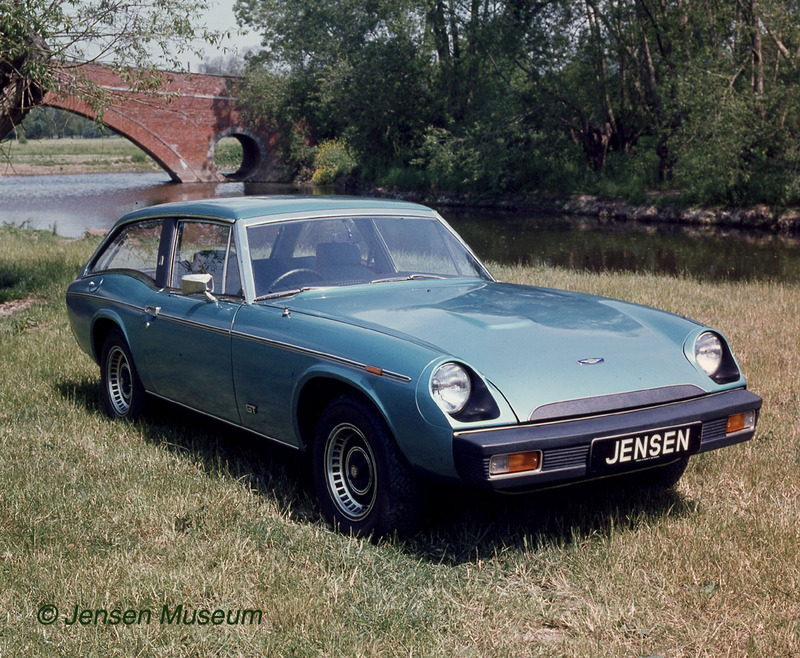 It was summer before production of the Jensen GT started, and at that time the Jensen GT was also launched publicly. The first completed cars were coming off the line in September, just as the Receiver was brought in. The first actual production Jensen GT was painted in silver grey, and had a trim specification of black with black cord seats. The car was completed on the 12th September 1975, and immediately registered as a factory demonstrator car. This car, registered KUE 662P, was given chassis number 30002. Although the Museum cannot find absolute documentary proof, it looks as though the factory allocated the first two chassis numbers (30000 & 30001) against the two prototypes (13910 & 19850). This would make sense, as Jensen Motors were known to change experimental / prototype chassis to the initial production number. However, for some reason, this never occurred. The first production Jensen GT (chassis number 30002), registered by the factory as KUE 662P, and used as a demonstrator car. The car survives today (2019), but in poor condition. side to rear view of the first production Jensen GT, KUE 662P. Options available to the GT customer included, a vinyl roof (available in both black or tan vinyl), likewise a vinyl / fabric sunroof was listed as a option in August 1975 (an expensive option at £117) for the home market, though this had been deleted by February 1976. Air-Conditioning was another listed option. An early production Jensen GT (chassis number 30045), one of the few GTs fitted with the expensive factory sunroof. The interior came in a range of standard options , which included Qvale’s electric blue & orange fabric with tan vinyl, the same electric blue & orange fabric with black vinyl. The take up on this was relatively small, with most customers picking one of the following no additional cost fabrics, black cord and black vinyl, tan cord and tan vinyl, blue cord and black vinyl, beige cord and tan vinyl. For just over £100, there was also a leather option, with black, tan, and beige being the standard leather colours. This LHD GT had Qvale’s electric blue cloth with black vinyl. RHD Jensen GT with black cord and black vinyl trim. One of the standard interior options of beige cord and tan vinyl on this RHD GT. Front and back speakers were fitted as standard, but the customer could request which stereo unit they wished. A blanking plate was fitted if a customer didn’t request a stereo unit from the factory. By the beginning of autumn 1975, production of the GT was underway. This coincided with stopping production of the Jensen-Healey. By the end of September just under twenty GTs had been completed, and in the following months production ran at around fifty GTs a month. 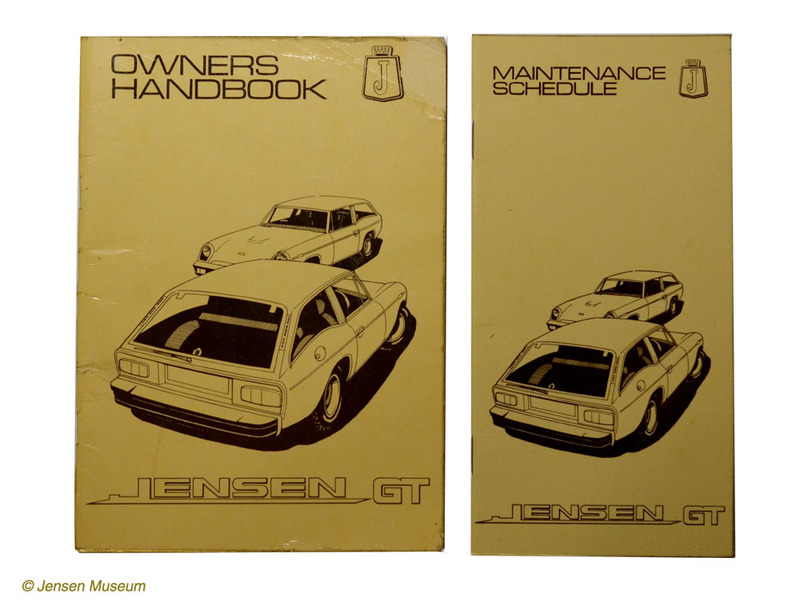 The new owner of a Jensen GT was provided with an Owners Handbook, and also a Maintenance Schedule booklet for recording the servicing of the car. This makes it sound as though Jensen GT production was running straightforwardly, and without interruption. However, this was far from the truth. When one looks at the situation Jensen Motors were in, it is hard to imagine they could build over 500 GTs between September 1975 and May 1976. In fact the Receiver came in just as production of the GT started, and finances were kept on a tight reign. “The GTs were being built over in the former Jensen Healey bay. I was working on Interceptor assembly, but occasionally I was pulled off the Interceptor line to help on the GTs. Typically I’d be doing something like fitting the rear quarter glasses. Over where the GTs were being built up, you would always find a batch of ‘dead’ cars that had been pulled off the line and deposited in a corner somewhere. The problem was that suppliers were getting jittery, and were demanding payment up front for stock. Then on top of that the Receiver checked every penny that was going out, making sure that not too much stock was bought in at any one time, and also that it was stock that was needed. So, you might find that we were running out of something like the walnut veneers for the fascia. So after the last ones had been fitted, there could be a delay before another batch arrived. Meanwhile cars were nearing completion, but with no fascias fitted. We would be told to get those cars as complete as possible, then they were pulled off the line and put in a corner. Despite these set-backs, enough GTs were being finished and sent to sales, and public opinion for the new Jensen seemed positive enough. Jensen Motors had their stand booked for the 1975 Earls Court Motor Show, and even with the Receiver holding the purse-strings, the Company were going all out, with no less than four cars being show-cased. There was a Jensen Interceptor, a Jensen Convertible, and the two new cars, the Jensen Coupe, and the Jensen GT. Firm launches £12,000 new car. “The new £12,000 Interceptor [coupe] shows Jensen is alive and kicking”, Mr.Good said. The new car – a coupe – was unveiled at the Motor Show Press Preview. “You could say we have pulled off the show surprise” said Mr.Good. Good didn’t mention the Jensen GT at all, which on the face of it seems strange. The reality was that from a branding perspective, Good saw the Interceptor, and Interceptor derivatives, as being the Jensen icons, and didn’t want to waste valuable publicity moments discussing a car that to him, was fundamentally a Jensen-Healey derivative without the Healey name. 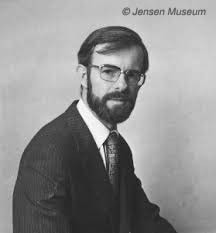 David Millard’s display of positive sales for the Jensen GT wasn’t unfounded. Feedback from the distributors, about the GT was excellent. Likewise, both Autocar and Motor gave a favourable response to the car they tested, although both had issues with the heating / ventilation, and the flat spot that persisted with the Lotus engine. 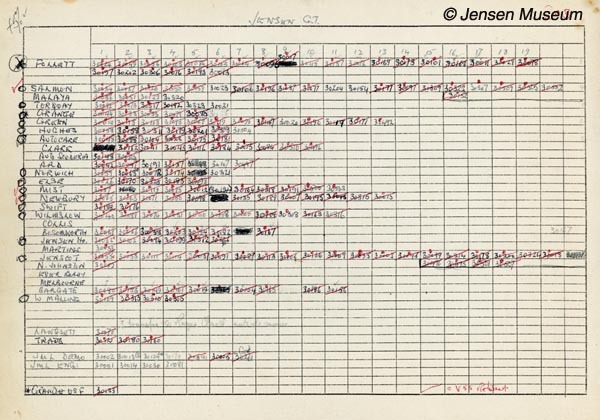 One of the original sales breakdown charts relating to the Jensen GT. The chart went down by distributor, and across by by chassis number. Sales Administration Manager, Jim Branson, had the job of keeping track of orders and completed sales to various distributors. They were told to call the Jensen GT – ‘The Econo Jensen’ – a car that has grand luxury on a small scale, with sports car performance and handling. As with the London Motor Show, the Jensen GT was well received at the San Francisco Auto Show. “Like the crack of a baseball as it leaves the sweet spot on a bat to begin its trip over the centrefield fence, there seems to be something almost indefinably correct about the Jensen GT: something right on target for that particular type of man who knows what he likes but has a hard time finding it. This is a car for a man but not for an MCP; unlike a lot of other “GT” cars, the person who buys this will likely have few hang-ups about his own ego. He will have little need to prove anything to anybody. He will simply buy it because he likes it. It seems to strike the perfect blend. The Jensen GT continued to be made right up until the last day of operations at the factory, Friday 21st May 1976, when eight were signed off. One uncompleted shell, included among the goods auctioned off in the receiver’s sale in August 1976, was finished in 1987. We hope you have enjoyed this feature. If you would like notification of when new features are added to the Museum website, then why not subscribe. It’s free, and takes just a couple of minutes. Simply press the Subscribe to our mailing list link below. INFORMATION SOURCES: Information supplied by Tony Good 21.12.2018. Information supplied by Andy Hunter autumn 2018 (various dates) Information supplied by Tony Marshall on 29.12.2018. Information supplied by Alan Vincent 23.1.2018. Information supplied by Clive Kendrick autumn 2017 (various dates).